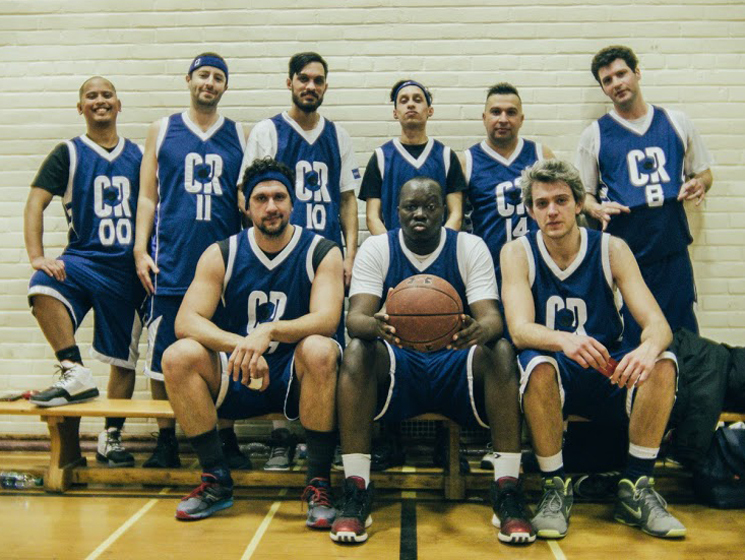 The Comedy Records basketball team shows off the thing they're less good at. Not pictured: hilarity. Canada's only dedicated standup and sketch comedy label is putting on a show! Comedy Records and Exclaim! are teaming up to launch our monthly Comedy Records Showcase, to take place the first Thursday of every month at Wenona Lodge (1069 Bloor St. W.) in Toronto. The first event will take place on Thursday, October 6. "[Exclaim!] is one of the few publications that regularly covers comedy," says Comedy Records co-founder Barry Taylor, "and their extensive ties to Canada's music community will help expose the comedians we work with to a whole new audience." As the comedy boom has continued to expand in recent years, Exclaim! has been dedicated in its ongoing coverage of both emerging and well-known comics, through artist interviews as well as reviews of shows and standup specials. The opportunity to further support the emerging comedy community by giving comics a place to be heard is an exciting next step. "We've hung out with members of the Exclaim! staff and they're clearly as unstable as any comedian working today," Taylor adds. "It's a natural fit." As the only dedicated comedy label in the country, Comedy Records is uniquely position for this opportunity. "We've recently expanded into the U.S. and are collaborating with American clubs to regularly showcase Canadian talent," Taylor offers. In addition to running the label and performing comedy himself, Taylor also has ties to the Toronto sports scene as co-host of the Talking Raptors podcast with fellow comedian Nick Reynoldson. "[Comedy Records] have our own basketball team that plays Monday nights in a four-on-four rec league. We're not very good, but our uniforms are amazing, so we look great whenever we play." The Comedy Records Showcase will be unique in the city for its equal-opportunity structure, giving three different comics equal stage time rather than adhering to a more traditional schedule. "The idea is that people will be able to come preview some amazing talent and then when the comedians have an event or show of their own, those same people can go out and support them," Taylor says. "Of course, they can also support the comedians by purchasing their albums," he says, adding: "All the album profits go to the comedians, so this isn't a dirty record label move." Comedy Records and Exclaim! are happy to be part of the wealth of comedic talent in the country. "Canada and specifically Toronto is home to some of the best comedians on the planet," according to Taylor, "however they often don't receive the recognition they deserve. That's slowly starting to change. We're happy to be part of it." Exclaim! Presents the Comedy Records Showcase will launch on October 6 at Wenona Lodge and will continue on the first Thursday of every month. Admission is PWYC; lineup to be announced shortly.